NEW BRITAIN - Central Connecticut State head football coach Pete Rossomando is a big believer preparation throughout the week is the key to a good result on game day. It’s part of the reason why the Blue Devils look to have finally hit their stride this season. 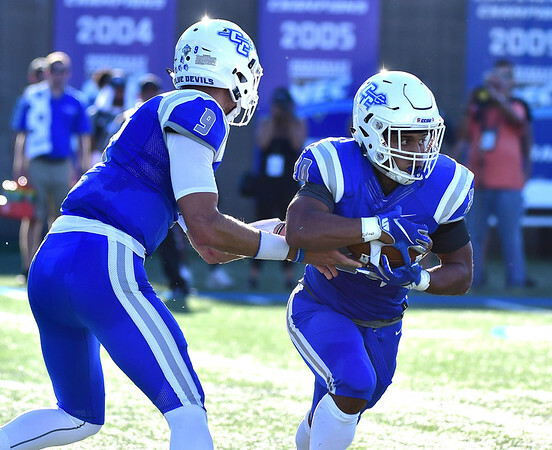 CCSU is coming off back-to-back victories for the first time this year after flip-flopping between wins and losses through the first five weeks, putting up more than 650 yards of total offense and at least 48 points in each of the last two games. Today, the Blue Devils (4-3, 2-0 NEC) go for their third straight win this season and ninth straight in conference play as they host in-state rival Sacred Heart (3-3, 1-0) in their first home game since Sept. 15. Some consistency is going to be needed today against a Pioneers team that has shown the ability to score this season. Outside of last week’s loss to Dartmouth, when Sacred Heart failed to find the end zone, the Pioneers haven’t scored fewer than 24 points in a game. Jordan Meachum and Julius Chestnut are Sacred Hearts’ top tailbacks. Meachum ranks fourth in the Northeast Conference with 533 yards on 106 carries and second in the league with 88.8 yards per game. He also has a team-leading four rushing touchdowns. Chestnut has 224 yards and two scores on the season. Quarterback Kevin Duke has been able to hurt opponents with both his arm and legs. The fifth-year senior has completed 54.7 percent of his passes for 1,076 yards and 10 touchdowns with five interceptions in five games. He missed the Pioneers’ shutout loss to Dartmouth last week due to injury. Duke also ranks ninth in the NEC in rushing yards per game with 57.4. He’s currently second on the team with 287 rushing yards and two scores. At the same time, the Blue Devils’ defense should be heading into the matchup with plenty of confidence. The unit is coming off a game in which it allowed the fewest amount of points to a Division I opponent this season and has three takeaways over the last five quarters of play. Last week, Bryant managed only 292 yards of total offense against CCSU. The Bulldogs came into the matchup leading the conference in total offense (429.2 yards per game) and was second in scoring offense (33.8 points per game). The Blue Devils’ defense also held them to 38 percent on third downs. While CCSU has also done well offensively since starting conference play, it’ll have a different challenge today against Sacred Heart, which is second in the league in both total and scoring defense. “They’re fast on every level,” Rossomando said. The Pioneers’ defensive ends, Chris Agyemang and Aaron Donalson, are the two biggest threats. Agyemang has 5½ sacks on the season, while Donalson has three, and the Blue Devils have given them extra attention during the week, trying to simulate their speed. CCSU has the size advantage up front and has been successful in running the ball of late. Running back Drew Jean-Guillaume alone has 360 yards and four touchdowns in the last two games, but the Blue Devils are likely to see more blitzes and plays off the edge than they have at this point. Now, CCSU will see if all that preparation will pay off. “We’ll see how we handle success,” Rossomando said. Posted in Newington Town Crier, UConn on Friday, 19 October 2018 21:23. Updated: Friday, 19 October 2018 21:26.